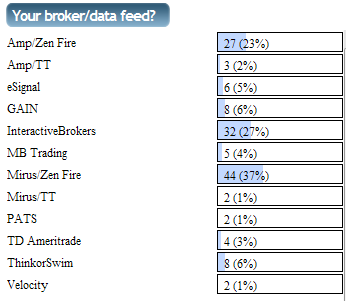 Below are the results of the last poll where I asked which broker and data feed you used. I hope I didn't forget to list any, because I did forget to list the "Other" option after the poll crashed the first time I set it up! It looks like the overwhelming majority depend on Zen Fire for their data feed, with most people using Mirus as their broker, followed by IB then Amp. I've used IB in the past, and use Amp now, so have a little experience with them. IB is pretty much the only option in my opinion if you need to trade stocks. If you are futures only, then Zen Fire is the only option, and Mirus and Amp are both great from what I've read and experienced personally. Did I miss any major broker or feed? Let me know. Great Blog! Had a question, how do you get the programing experience need to program your own indicators? Did you get a book like "Learn to Program in C# in 21 days" to teach you C#? or did you just jump into the code and figure it out? Thanks, I am trying to program a system using a Ninja and have this book. I'm 31 and have been programming since I was about 13 so almost 20 years. I knew Pascal and C++ when I was 15. I just recently learned C# once I started using Ninja. Really, all languages have a great deal in common, so once you know PHP, Perl, C etc etc then you will understand the basics and just have to adapt to fit the language syntax. There are many great books on C# but I've not read any of them. For me, I learn best by example, so I learned C# by just viewing all the indicators I could find and going from there. I also recommend for traders to hire a Ninja consultant to get their first project/idea written, and then view the source of that project and understand how they turned your "plain english" idea (which you presumably understand very well) into a C# ninjascript, you can learn a lot from that type of approach. Any tips on choosing between AMP and Mirus? I'm going the zen-fire route, but not sure which way between AMP and Mirus. I can't help having not used Mirus, but I've heard good things about them. I had some minor issues with Amp when I first created my account, but all were resolved quickly by Dan. Have had no issues since. Hi Mike, why do you think that IB is not good for futures? I know they don't provide tick data, if this is the case why for stocks it is OK, but not for the futures? IB has terrible historical servers and is terrible for live tick data. Minute data is fine, tick data is terrible. I would venture most people trading stocks are not using tick charts. Mike, I am wondering if any of your indicators are available in EasyLanguage?